Medallion that was given to Jambi from the Ottoman Empire. In Jambi it is known by several names: Kalung Bintang Kejora (Morning Star Necklace); Bintang Turki (Turkey Star); and Medali Turki (Turkey Medallion). This post is about an medallion that is on view at the Museum Negeri Jambi. 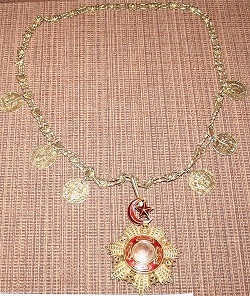 The medallion originated from the Ottoman Empire and was given as a gift to Jambi. To obtain military support to overcome Dutch colonialism, Jambi’s Sultan Thaha sent his prime minister to the Ottoman Empire to receive a sign saying Jambi was under the protection of the Ottoman Empire. The Museum Negeri Jambi indicates the year was 1880/1881 AD. Most references indicate that this Jambi prime minister was “Datuk Abdul Aziz.” Instead of providing military support, the Ottoman’s instead gave Jambi a medallion to signify friendship.